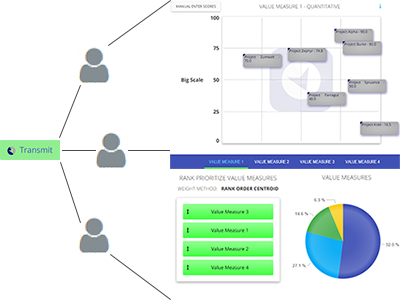 Build confidence into your strategic decisions with a repeatable and transparent collaborative planning and decision process driven by automated user and participant workflows. We made it easy for your team to provide meaningful input with multiple trusted, and academically grounded drag-n-drop priority weighting methods. 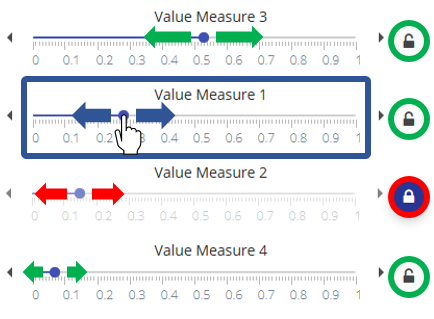 Know your BEST course of action with actionable and granular alternative value analysis driven by portfolio optimization selection recommendations. Know when you have consensus. More importantly, know what differences and sensitivities are preventing unity. Fully automated decision summary, alternative and participant reports. 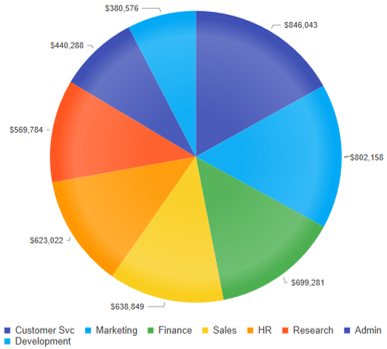 Customized or branded report formats available. 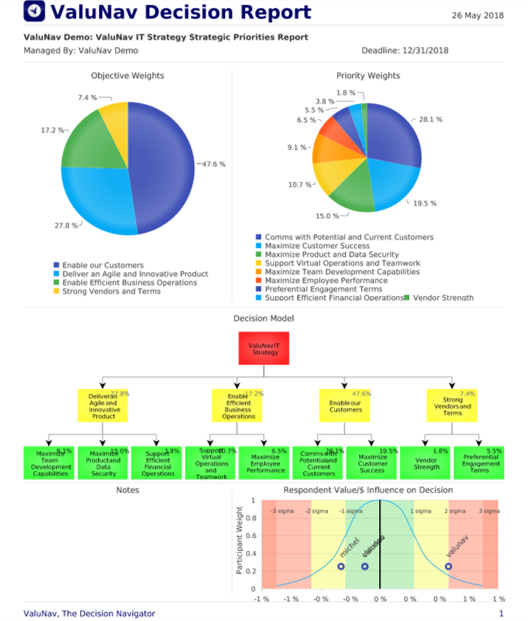 Organizational and user dashboards highlighting utilization and the savings potential and value generation achieved. 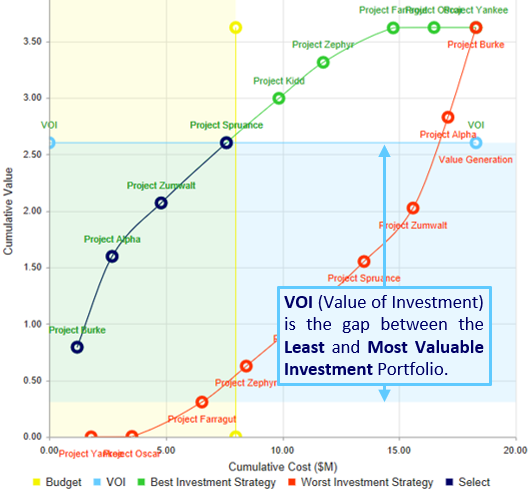 Select or prioritize a set of Value/$ optimized alternative(s) (projects, initiatives, investments, etc.) within budgetary and dependency constraints. Find best options and conduct what-if negotiation analysis. Make collaborative and critical one-off selection decisions such as vendors, new-hires, cars, houses, vacations, college selections, jobs, etc. Find the greatest value within the budget. Develop a strategic plan with collaboratively weighted performance measures/priorities and objectives. Participant inputs are aggregated and analyzed for sensitivities and differences. Know your team alignment and influencers. Develop a strategic plan and then distribute a strategy-aligned budget across multiple operating departments or activities. 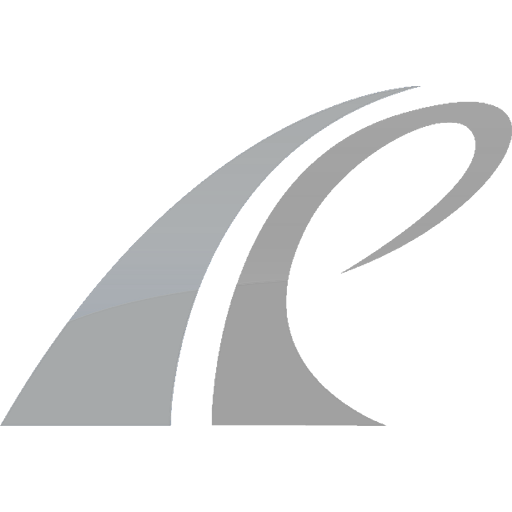 This analysis will seek to fund all alternatives in relation to their associated performance and value to the overall strategy. 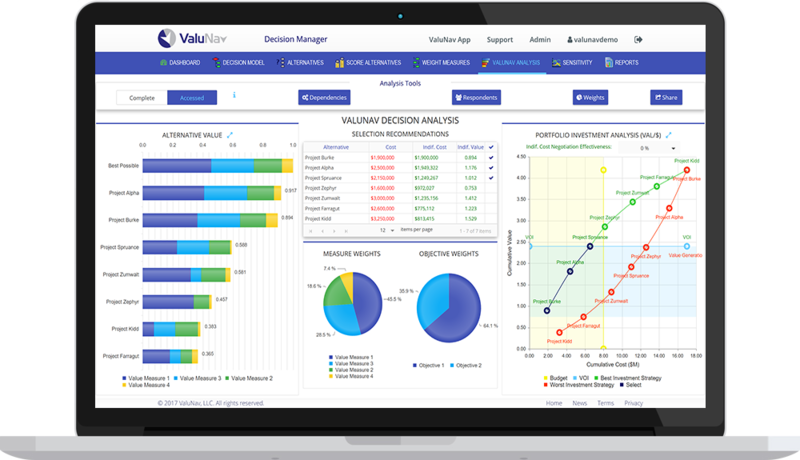 ValuNav's Portfolio Optimization and Negotiation Strategy analyses can help your organization SAVE 10x over your annual ValuNav subscription costs in just one use AND realize a 10x increase in the value of your resource decisions. Build your visual strategic performance map with automated tools and save files for later reference. Define the key success drivers for your planning decisions. Define performance metrics using customizable, multi-dimension and utility-function driven tools. 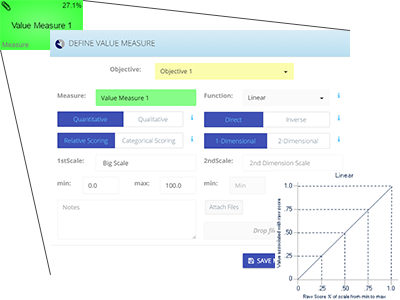 Value Measures are the foundation of ValuNav's analytic engine. Enumerate and define all feasible alternatives under consideration. 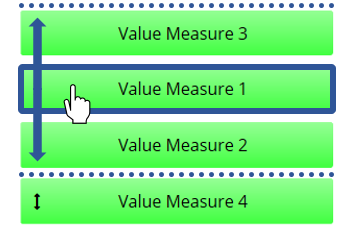 Then evaluate alternative performance against each value measure by: 1) drag-and-drop; 2) manual data entry, or 3) upload from external data sources such as excel. Use intuitive and academically grounded tools to apply weights to your strategic priorities. Trusted and proven drag-and-drop methods available include: 1) Rank Ordered, 2) Categorical Importance, and 3) Manual Sliders. 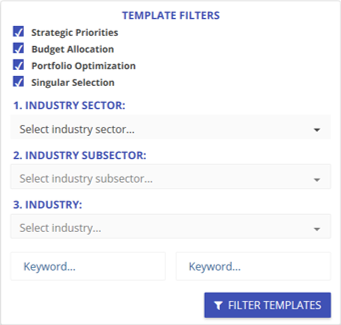 Elicit and receive stakeholder input on how alternatives perform against strategic priorities and on the relative importance (or weighting) of strategic priorities. Align your team! Invited participants receive customized application experiences that guide them through providing the requested input. 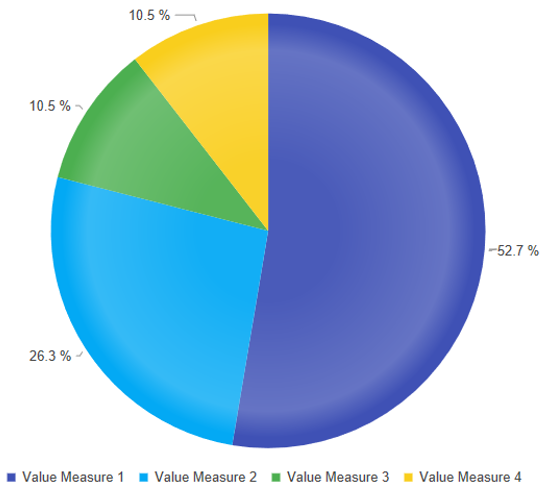 Review actionable and concise ValuNav analysis results that highlight: 1) granular alternative value performance, 2) alternative selection and cost negotiation recommendations, and 3) portfolio investment (order-of-buy) analysis with Value-Of-Investment (VOI) examination. Maximize the value of your resources! 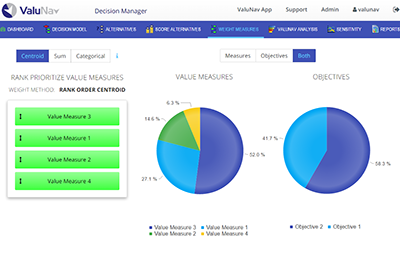 ValuNav helps teams align strategic priorities and maximize Value-of-Investment with every decision. Concise visualization of each alternative's value performance according to each Strategic Priority. See what is performing and what is not. 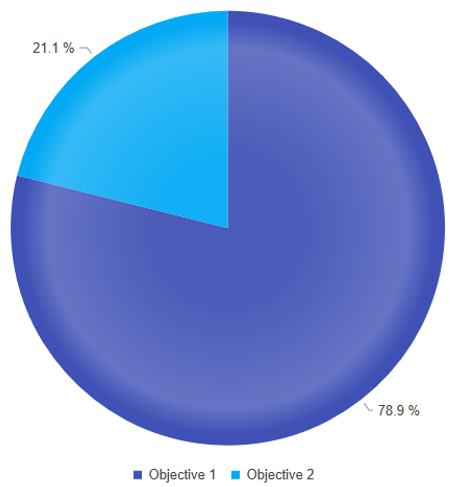 Resource allocation recommendations according to cumulative value-per-dollar as well as indifference cost targets. Know what something is WORTH according to your definition of VALUE. 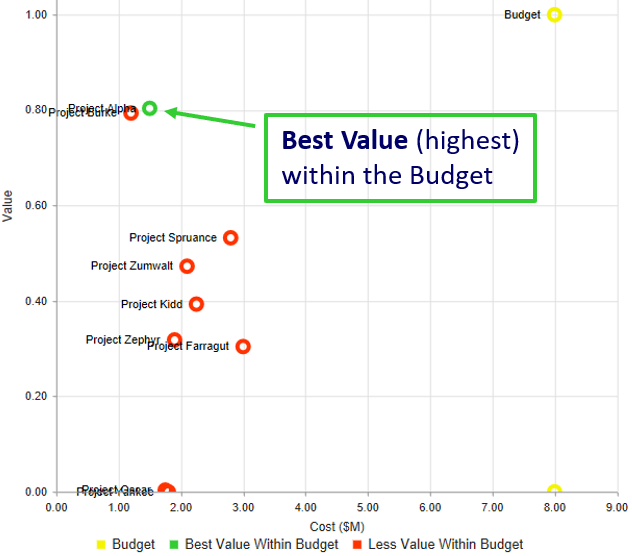 Optimized order-of-investment analysis with clear value generation and budget alignment visualizations. Maximize return across multiple value vectors. Relevant and automated analysis tools for considering alternative dependencies, participant input weighting, value measure weighting, etc. Get the answer to "What-If?" immediately. Flexible Subscriptions Available - Start with a Free Trial! Collaborative Planning Capabilities Register Let's Go! Let's Go! Let's Go! Subscription Rates Register Let's Go! Let's Go! Let's Go! Powerful capabilities that lead to faster, more transparent and greater value strategy decisions! 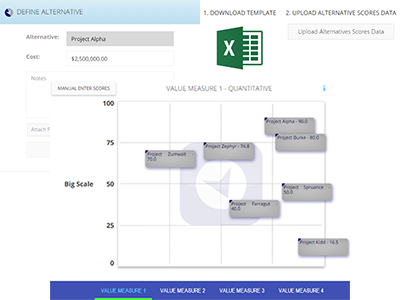 Select or prioritize a set of Value/$ optimized alternative(s) (projects, initiatives, investments, etc.) within budgetary and interdependency constraints. Find best courses of action and conduct what-if negotiation analysis. Make collaborative and critical one-off selection decisions such as new-hires, cars, houses, vacations, college selections, jobs, etc. Then, aggregate weighting inputs from participants and perform sensitivity analysis of any differences. Know your team alignment and influencers. This analysis will seek to fund all alternatives in relation to their associated performance and value to the strategic priorities. Priority weighting has never been easier! Categorical weight is a function of importance and variance (or spread) in Alternative performance against each Value Measure. 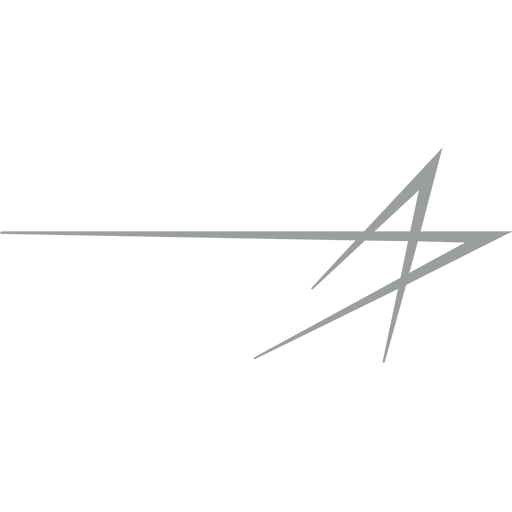 All slider weights must SUM to ONE (1). Unlocked sliders will auto-adjust when another slider is moved to keep the sum of ONE. Locked sliders will not auto-adjust. 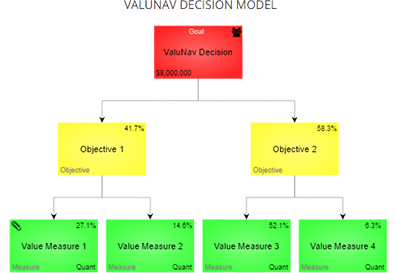 Access ValuNav's growing library of decision templates. Search via industries and keywords, and then download a model that meets your needs. You can customize it from there. 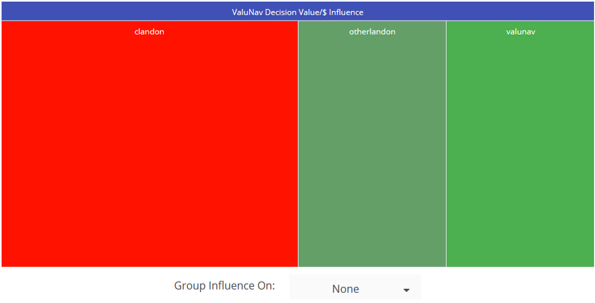 The Influence TreeMap presents each participant's Priorities Weightings Variance Influence on the group. Green indicates the participant increases strategy consensus (positive), while Red indicates a negative influence. 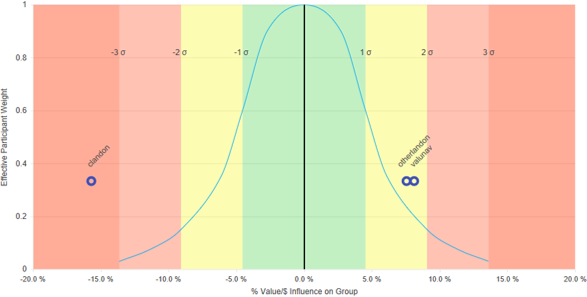 This normal curve shows the magnitude of each participants' influence on the group. Significant influence can indicate bias and/or misalignment with the team on the strategic priorities of a decision. Paid subscribers have access to our customizable pdf and hi-res image decision summary reports. Our repository of Performance Management and Decision Analysis resources are available to all subscribers on our Support page. ValuNav also manages a closely monitored FAQ service where you can search for information or post a new question. Paid subscribers will have direct access to our team of Technical Support for issues related to platform training, account maintenance, organizational management, etc. Above all else, we want our customers to be successful and receive maximum value from ValuNav's capabilities. Expert strategic performance management and group decision facilitation services are available to our Budget and Portfolio level subscribers. Scheduled sessions can be conducted via phone or video teleconference. All subscriptions are for a minimum of one (1) year. Annually Paid subscriptions receive a 20%+ discount. Multi-Year Discounts are also available. Please give us a call! Users are registered by name according to the terms and conditions agreed upon at time of registration, an organization's contract or both. 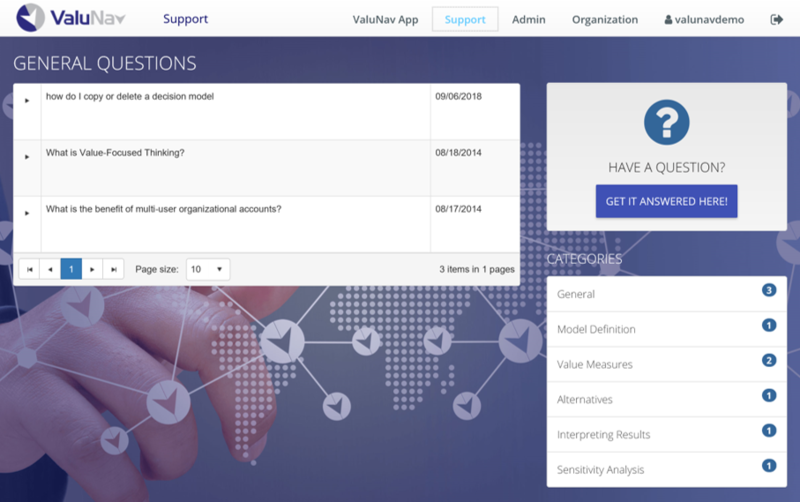 Users build, manage and deliver ValuNav models on behalf of their organization and/or external clients. Participants are stakeholders invited by email address to provide input on models, such as how alternatives perform against value measures and/or the relative priority/weighting of value measures within a strategy. 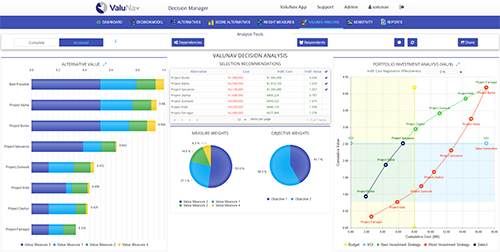 Trial accounts have access to nearly all of ValuNav's advanced features, capabilities and support to help your organization make Better Decisions through Intelligent Collaboration. 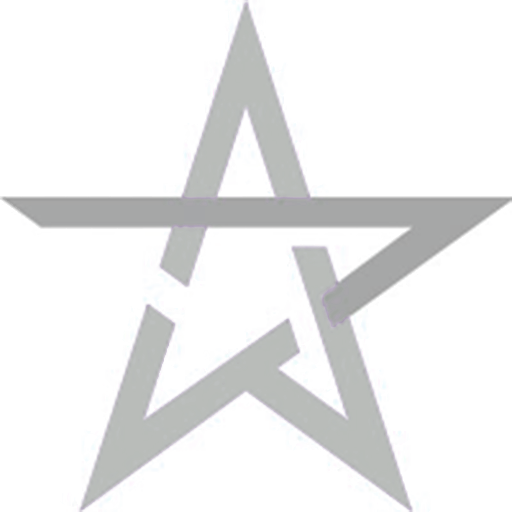 After 30 Days - Organizations that have not converted to paid ValuNav accounts will be automatically converted to Limited Freemium Accounts, and will lose access to any advanced decision models created during their Trial period. Trial data will not be deleted and will continue to be available should a customer subscribe at a later date.